The bag itself is rather pretty this month (complete with friendly little bat zipper pull) but if I start keeping more than one of these at a time for myself, it's a slippery slope to hoarder status. Trust me on this. Instead, I will encourage my 6 year old's hoarding and give this one to her to use for crayons, hair clips, or important legal documents that she needs to keep track of in her rather busy day-to-day life. It Cosmetics Bye Bye Pores Pressed Powder — I was excited to try out some new powder this month—especially something that is regularly priced way beyond what I would ever spend. (Half the fun of Ipsy is getting to try products that I'd never afford in "real" life.) The powder itself looks outrageously light, even for a fair gal like myself, but once I put it on it worked beautifully. It claims to make your skin look as though it has no pores, and I must say this was not the case for me. But I actually prefer to not look like an airbrushed magazine ad, and having pores makes me human, so I shall embrace them. That said, the powder is fantastic and I will definitely continue using this sample! I'm happy to have something small to throw in my purse for on-the-go. 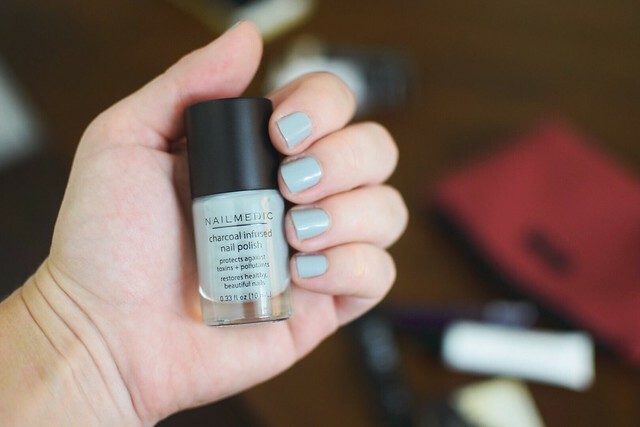 Nail Medic Polish in Volcanic Ash — Hooray! Nail polish! I get a little too excited when they include polish in a color that makes me swoony. See further down this post for a better photo of the color and some more thoughts on the actual polish. Tarte Deluxe Lights, Camera, Lashes Mascara — This mascara works very well and doesn't make me smudgy at all by the end of the day (which is always the challenge for someone with deep-set eyes). It's a winner, for sure. Is this how fancy people take photos of their nails? Let's just go with it. I almost never have my fingernails painted these days (gone are the days of my beloved, weekly at-home french manicures) but I really liked the color polish they sent me this month and decided to try it out right away. This photo is after two coats, but before I added the topcoat (the topcoat made it extra shiny, and I'm rather pleased with the result). 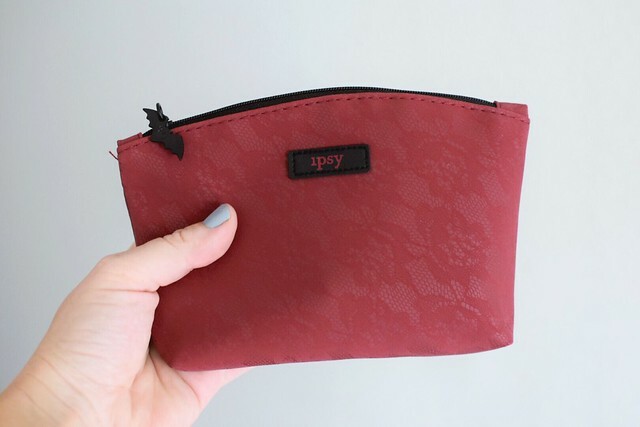 If you're interested in signing up to receive your own Ipsy bags, feel free to use my referral link! Each month you'll receive a customized selection of 5 beauty products tucked into a little bag for only $10. You can cancel any time and aren't required to pay for anything beyond a month-to-month subscription. 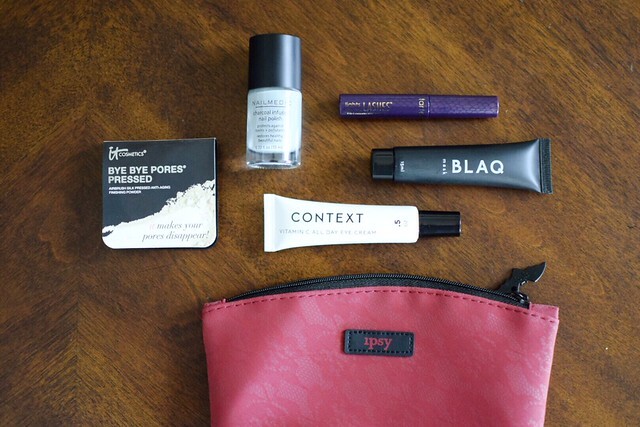 I pay for each of these bags myself and am not being paid to review these products—I just legitimately love and recommend Ipsy to people in "real life" and want to share the goodness here, too! If you use my referral link, I receive points on my account that I can redeem for extra beauty products, but that's it. What did you receive this month? Any new favorites? Wow! I got totally different stuff than you did, except we got the same nail polish. I might paint my nails tonight! I got an urban decay black eyeliner, a bronzy eye shadow, an amazing foundation sample that's a perfect shade, and the best hand cream I've ever used and is already living in my purse. It was definitely a winner. I got my first Ipsy bag yesterday, & I got totally different things from you - but very similar things to the other commenter, though I got a coconut hair oil instead of a hand lotion. I'm not SUPER excited about what I know from past experience that the eyeliner isn't my favorite, & I don't need a foundation because I just landed on one I adore. The eyeshadow is a great color, though, & the hair oil smells diviiiiiine. That reminds me - my hair is wet, & I need to go use it, stat!